Hello, my name is Victor Lopez from Puerto Rico. I recently graduated from a free Bakery Course offered the city. I am retired on social security disability and I am 59 years old. Every couple of months I call a group of my musician friends to jam or play classic rock which I love. I play guitar and sing in the jam sessions. 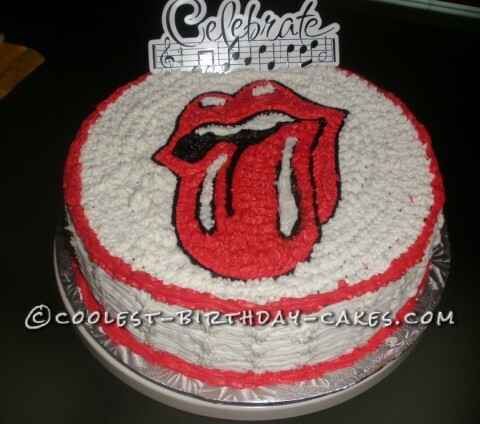 For this session a decided to bake a cake and decorate it with the Rolling Stone Logo ” the tongue”. For the logo I downloaded from the internet and printed it on paper. Then I sketched it on a piece of edible rice paper with an edible ink marker. I proceeded to prepare the mix with the great recipe I used and baked the cake at 350 degrees F for almost 1 hour on a round 8 x 3 baking pan. I prepared the syrup to moist the cake with sugar and almond syrup and when the cake was ready and cool I got it nice and moist with the syrup. Then I placed the cut to size rice paper with the logo on the cake and drew the logo with black frosting line tip. I proceeded to finish frosting the colors of the logo and then the rest of the cake, lots of work. Anyway the cake came out good, tastes great, lots of almond syrup. The jam was a success and everybody took some cake home for their wives and kids. 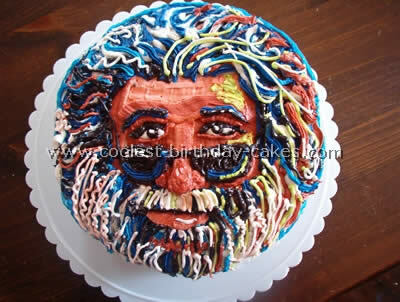 Birthday cake idea Posted by Victor L.